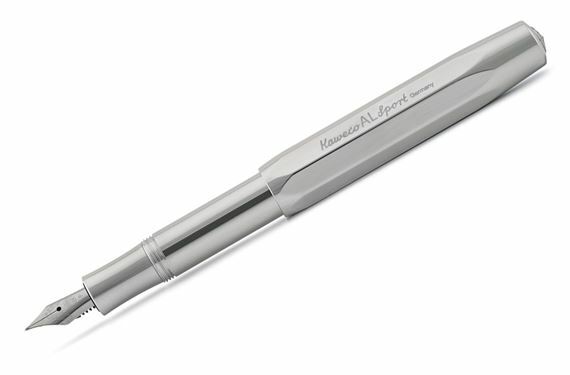 Order your Kaweco AL Sport Raw Aluminum Fountain Pen today from FahrneysPens.com. Fine Pens, Refills & Luxurious Gifts – great prices & fast shipping. For generations, writers have enjoyed the compact convenience and style of the Kaweco Sport pen. Its German-made, 8-sided design has not changed since 1935; its a true classic! Kaweco updates its traditional pocket-sized pen with the new AL Sport in solid aluminum or brass - the raw metals are machined and polished to perfection for a pleasing surface feel. The natural metals give the pens a solid weight in the hand and will produce a handsome patina over time. The AL Sport is available in four writing systems. The fountain pen with threaded cap has a sturdy steel nib and measures only 4.1" closed; 5.2" when posted. The capped rollerball has the same dimensions as the fountain pen. The ball pen and 0.7mm pencil feature a one-handed push-top mechanism. Try the solid metal AL Sport and you'll agree with Kaweco's slogan, "Small in the pocket, great in the hand"! Cartridge/converter fill. Converter not included.